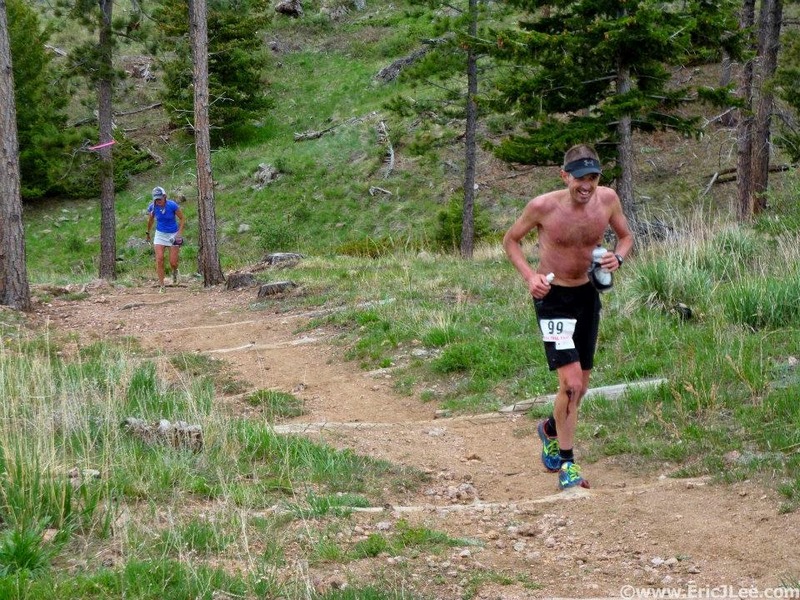 The third round of Quad Rock packed another wallop, but not enough to knock out over 350 of us who took on a vertical mile of burly climbs and descents, with 132 folks making the decision to turn around and run everything again in the opposite direction. This was my slowest finishing time yet, and I was unable to finish in the top 10, but by no means did that make for an unenjoyable race. That's because of the fantastic race organization and community of fellow runners, spectators, and volunteers, to go along with some of the best runnable trails on the Front Range. 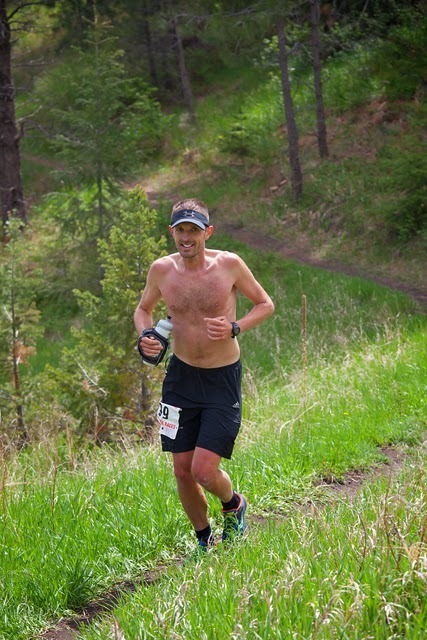 With the same tales on the same trails as previous years, augmented with an handful of shirtless un-glamour shots, why bother with another race report? Mostly, I want to take the time once again to thank everyone involved with the race, and reiterate what a great event it is. Any indulgence from writing about the race is from people reading, commenting, or telling me that they've read these reports, and cheering by name during the race itself, which is incredibly rewarding. I know some people are trying to get all the information they can as they're excited about the race; others are contemplating the race as a new distance challenge, or a more difficult trail race than they've done before. A tip of the hat to both. I also have to back up and give Nick and Pete an extra "Thanks" this year because I was able to gain a free entry into a race that is already a bargain, whether you slice it by average cost of 50 milers; cost-per-mile; cost-per-minute; or the amenities (useful and aesthetic coffee mug, shirt, great food, beer, and music). This was because they graciously donated a Quad Rock entry as a raffle prize as a fundraiser to send legendary ultrarunning superfan (and fellow Packers fan) Bill Dooper to Western States. Jessica and I were happy to donate a small share to help Bill realize his dream, and then I was fortunate to have my name drawn for the Quad Rock entry. As another link to the race, it bears mentioning that Deceptively Fast Aaron Marks and QR-CR-holder Ryan Burch initiated the fundraising campaign; and as a testament to the broader running community, it's inspiring that 40 people donated more than enough money to get Bill out to Auburn (by way of Squaw). So with savings from the entry fee, I was then able to give a bit to Larimer County Search and Rescue, one of the QR volunteer groups and beneficiaries. (Admittedly, there's a reasonable chance that's more of a selfish "investment" than a donation). I'm not too much into pre-race "traditions," but again I went with a big rice stir-fry from East Moon. A difference this year was not sleeping in my own bed before the race, but because my wonderful in-laws put me up for the night (and various trailrunner friends undoubtedly would have done the same), I still only had a short drive in the morning, with a bonus of getting to play with my adorable niece and read her a new (used) book I brought about a bicycling turtle. The point here, is, if you're thinking about this race as a possible "destination" race, you should totally go for it! There's a ton to do in Fort Collins, great places to eat and drink before and after, and if you send out an email to the trailrunner list or use the ultrasignup forum, you might be able to find or share lodging or a campsite with fellow runners. One change this year was a start time of 5:30AM, negating the need for a headlamp (and the logistics of dropping them off/retrieving them) at the start. This also made it half an hour "warmer," which made a noticeable difference in making short sleeves tolerable at the start. Great change! As far as conditions, we had some rain a few days leading up to the race. Mud was a concern, even when parking in the morning, but it turns out the trails were essentially perfectly tacky. I checked in and chatted with friends, and then found myself in a bathroom line less than 10 minutes before the start. Now I hesitate to share my secret, but I quickly remembered the other bathroom up by the Timber Trailhead, a scant tenth of a mile up the road. I gambled and jogged up there, and the gamble paid off. As a small suggestion (if only to balance out my otherwise effusive praise and at least give the appearance of objectiveity), a few more bathrooms might have been helpful. Barely able to make it back in time, we were off with the usual mellow start at a chalk/flour line on the ground. I ran next to and chatted with former occasional training partner Sarah Hansen a bit, who was running the 25M, where she would eventually finish 2nd. Things were conservative and felt easy, yet I was a bit closer to the front this year. 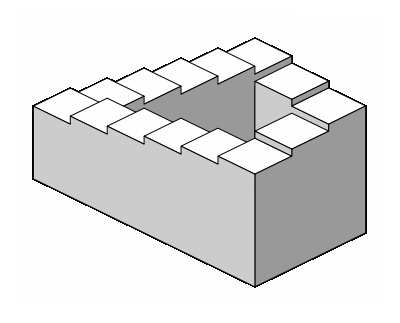 Then we hit Stout/Sawmill after a 24-25 minute warmup, and it was time for the business of the day: up, down, up, down...rinse, repeat -- a veritable Konami code of a course. On Towers, I was happy to hang out and chat with Nick D. He's one of the fastest Towers ascenders around, but he also hiked the steeper sections along with me, knowing full well the value of saving and using different muscles early in the race. We rolled down to the Horsetooth Trailhead just under 90 minutes in, which I think is a few minutes faster than my previous times. Everything still felt good, but it was warm enough (almost perfect) that I ditched the shirt already in my Horsetooth anti-dropbag as the sun shone down on the trail. As usual, I was overjoyed at seeing friends at each aid station, and received personal, quick aid station attention from NMP and the Erskine, Mr. May, and Deceptively Fast Aaron Marks, with cheers, greetings, and photography from others. If anything, I think I lingered a bit longer at aid stations this year to greet friends I hadn't seen in months. I should also mention, by way of advice, that the gel situation was a bit "sticky", let's say, at times. I really love the use of VFuel because the product itself, the folks that run it, and the support they give is top-notch. I also prefer the use of gel flasks to cut down on waste -- not just raw garbage (and those little tops of the packages that sometimes fall out of your pockets and into the weeds, despite best intentions), but the unnecessary silliness of sending a product out to be packaged unnecessarily. Thanks to this race for leading the way in reducing waste. Logistically, though, cooler temperatures made it difficult to pump/pour the gel from the bulk containers, and some aid stations were low later in the day. The volunteers did a great job of improvising anyway, and this overall wasn't much of an issue for me, but my thinking and concern is more for other runners coming later or arriving in larger groups. I was surprised to see Golden/Lakewood fasties J-Fitz and P-Mac pass me up. I wouldn't have thought they both had extra-long pit-stops, but it turns out they missed the Westridge turn -- which they said was indeed amply and adequately marked. Bummed that they tacked some on but hopeful that it wouldn't make much of a difference in the long run, especially if they didn't let it bother them mentally. Farther along in the race, by the Arthur's Aid station, I was again recharged by the sight of friends. But I was completely unprepared to see one person especially: Jane Welzel. A third of the way into the race, and it was already a good day. Race deja-vu for the rest of the first lap, although I was pretty much alone. I missed running with Alex and Lee from previous years! Ended up in and out around 4:08 or so, similar to previous years. ...Mostly. The advantage of the multi-loop course is seeing everyone else coming down. This ends up being a mutual cheering parade for over an hour. The parade begins with folks and friends that I know, some of which are literally chasing me, and then continues with an inspiring group of first-timers and others from all walks of life. Dare I say it, it makes the Timber Climb (which I was able to run entirely) almost a "freebie" if you let yourself flow with the spirit of the other runners. I try to call out as many people by name as I can, and am humbled by those that do the same before I can stumble out theirs. If you signed up for the 50 and have that moment of doubt, just turn around and head up, smile, and take out your headphones and cheer each other on! I have a commitment to cheer on each and every runner that I see, which is easy, but as I started downhill, I decided to turn the knob to "11" and really start whooping and shouting whenever I'd see a small group of folks pushing hard up the hill. It helps me as much or more as it helps them. Otherwise, I started faltering on the descent back to Arthur's, though, as my legs and feet weren't cooperating on anything technical. In future years (this is a note to myself as much as anything), I'd put extra training here, as it's probably also the section of trail, literally in the middle, that I run less than the other sections. This was a theme for the rest of the trail: losing ground on rolling, technical terrain. Caught a few people and passed by a couple -- still a net win. The only other thing of note was finding myself in the thick of the women's race. This was between Darcy Africa and Becky Wheeler -- 2 incredibly impressive runners with lengthy trail resumes. Usually, the competitive front-end of races isn't one of my top interests -- I'm more concerned with how my friends are doing (often enough, some of them *are* at the front, so I'm interested in that point). But I do appreciate the promotion of excellence in performance as supported by races, and Gnar Runners have done everything they can to recruit and reward fast men, women, and master's runners alike. While past races have had great performances all around, this one was shaping up even better with two experienced athletes pushing each other the whole way. And I had a front-row seat. Actually, a middle-row seat, for pretty much an hour and a half or so. As it turns out, I was running near Darcy all day. I actually can't think of a time where I've run that long, that close, to another runner. 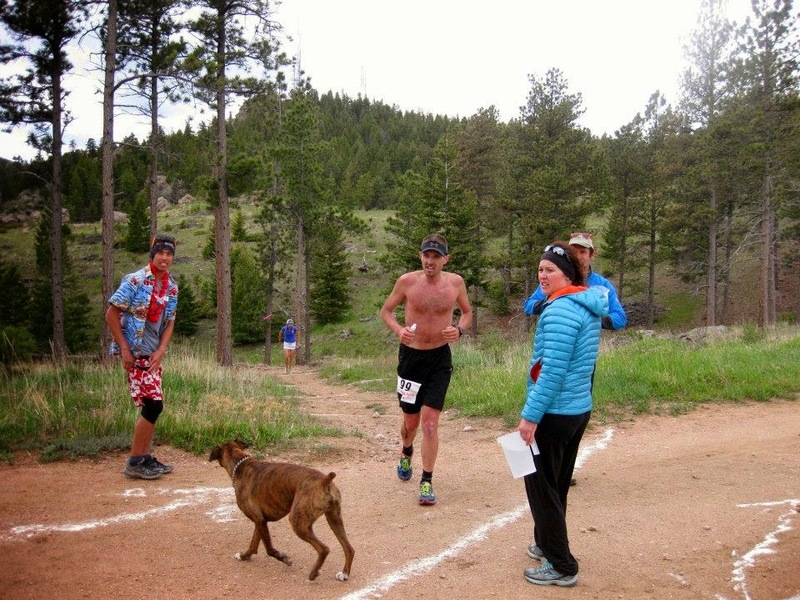 I've seen her very stout Hardrock finishes, and the only ultra I remember running with her was Collegiate Peaks a few years back, when her steady presence made me realize I had gone out too fast. We leapfrogged at nearly every aid station, as I'd run ahead and then linger a bit too long at the aid station. This went on for the entire 9 hours, as it turned out. If nothing else, it gave me the illusion of running steady. Rolling along Westridge was where I lost more time -- with Darcy pulling ahead, and another runner in a red shirt catching up to me. I didn't know nor think about gender -- just "blue shirt" and "red shirt." I have a tough time with Westridge in general, which is improbably uphill in both directions. Also had frustration with the technical parts of upper Horsetooth, and finally when it smoothed out, I tripped over a few granules of sand on the ground. I popped up before Becky ran me over, a little surprised she didn't even laugh at me. 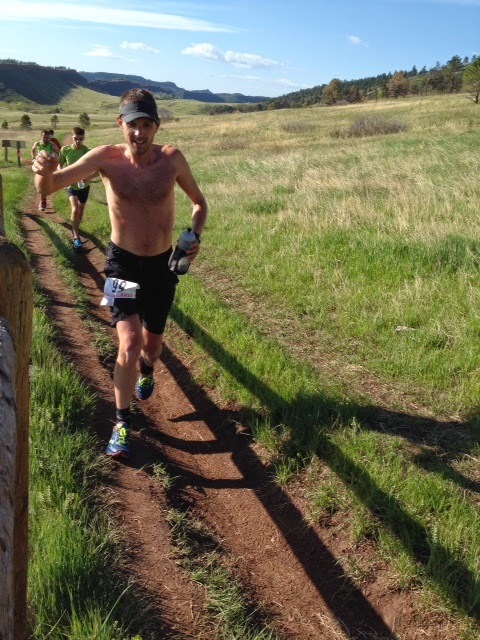 Luckily, I still had downhill roadie legs, which is what really saves me at the end of this dumb race, as I'm able to run the service road and Towers, so I was barely able to stay ahead, until both women exited the Horsetooth aid station ahead of me, and very near each other. With long views up Spring Creek, I was able to watch the chase unfold. Becky closed in slowly but not without a fight, and they ran a bit together. I was gaining on both of them, but needed to take the time to step off trail for a quick but important minute or two. They were still in sight and I was still gaining, but once Becky opened up a bit of a gap, she sped up. Again, Darcy and I swapped spots at the aid station, and both gave each other a "Nice work." Alex, Eric, Ellen, Rob, and crew had me in and out as fast as I was willing to go. They told us 5 miles downhill/flat, which is a double lie, because it's more like 6 miles and nobody should ever forget the rolling climbs remaining on Stout. I was optimistic about the Towers downhill, and able to catch back up to Darcy, but Becky was nowhere to be found -- not even a distant view on the Stout turnoff. She must have been flying. I was able to run the Stout climbs as well and wanted to get as much out of sight as possible from Darcy, but still stumbled a bit on anything semi-technical. Finally, the "flat" finish on dead legs. I did the math and realized 9 hours were out. Becky was able to do and thus set a challenging bar for the women's race. I checked over my shoulder once or twice or 80 times for Darcy: I dread ever having to race on that final stretch. Swapping positions 5 miles earlier would be fine, but would be quite distasteful that close to the end. I kept my eye on my watch to keep my 2nd loop under 5 hours, an arbitrary but extra goal. That's a bigger positive split than I'd like and has some lessons in it for the astute reader. Then again, when I train on this course it usually takes 5-5:30 for a single loop, so it blows my mind how much the race day support and excitement add to performance for anyone. "Top 15" (although there's really no such thing) was still much better than I expected. The attrition or folks that stayed with a 25M time unbelievably made the Top 10 within reach again, should only I have been in a similar shape as previous years, so a missed opportunity there. But I'll take it as yet another fun day on great trails with great friends. I took a good 20-25 minutes to change clothes and get recombobulated. (Protip: Bringing a bicycle is a good way to go back and spectate along the course, and/or make it the long 1/3 mile back to your car without hobbling). As fun as it was to run, it's even better to sit and enjoy a great veggie burger, tabbouleh, Pateros Creek brews, and good company with the Swashbuckling Doctors rocking in the background. Thanks everyone who was at the race, and thanks for reading. Hit me up if you want any extra motivation to sign up for this race or run it! It is as much of a shining example of a well-run race and supportive community as you'll find anywhere. Put it on the calendar to run, spectate, volunteer, and join the party. You had me at "veggie burger, tabbouleh". Sounds like a great race, I can't wait to tackle it next year. Congrats on the "top 15" finish. Not only another great write-up of another great performance, but -- again -- I marvel at how you can put together such a detailed and interesting narrative afterward. In my experience .... "It was good" or "it was fun" was about all I was ever able to muster. You must have your head pretty solidly about you to do what you do AND tell the story so well when you're finished. Did you know that you can create short urls with AdFly and receive $$$ from every visit to your shortened urls.